NEW DELHI (Sputnik) — This version of the Long Range BrahMos Missile was fired from INS Teg, a guided missile frigate, on a target on an island in the Bay of Bengal. "Indian Navy successfully test-fired supersonic BrahMos missile from a stealth frigate in the Bay of Bengal off Odisha coast. Until now Navy had only antiship version of BrahMos missile. This one is the land-attack version with a range about 300 kilometers [186 miles]," the source told Sputnik. The BrahMos Missile has been jointly developed by India and Russia, and its Anti-Ship variant has already been inducted into the Indian Navy. "This successful maiden firing of BrahMos Land Attack Supersonic Cruise Missile has significantly enhanced the prowess of Indian Navy and has placed India in the club of a select few nations," an Indian Navy statement said. The Land Attack variant provides Indian warships the capability to precisely neutralize selected targets deep inland, far away from the coast, from stand-off ranges at sea such as radars, command centers, airbases, and enemy missile batteries. — TIMES NOW (@TimesNow) 21 апреля 2017 г. ​A majority of the frontline ships of Indian Navy, like the Kolkata, Ranvir and Teg classes of ships, are capable of firing this missile. The Indian Navy has six Talwar class frigates, of which three are armed with the Russian-made export version of the Kalibr cruise missile complex while the other three are outfitted with BrahMos multipurpose missile system. On March 11 this year, an enhanced version of the BrahMos supersonic cruise missile with an Extended Range of more than 400 kilometers was successfully test-fired at a supersonic speed of 2.8 Mach. BrahMos, a word combining Brahmaputra and Moscow, is a short-range supersonic missile, which has been used by the Indian Navy since 2005. The missile can carry a conventional warhead of up to 660 pounds. BrahMos missiles can be also launched from submarines, as well as aircraft and land-based launchers. 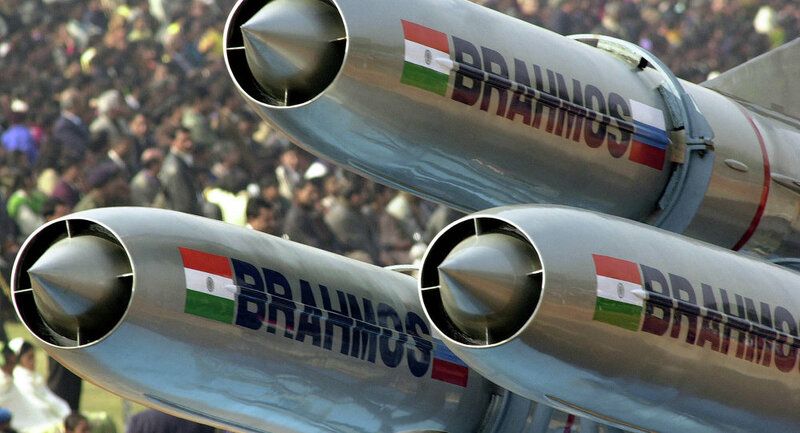 BrahMos Aerospace, the developer of the missile, was formed by India's Defense Research and Development Organization and Russia's NPO Mashinostroyenia in 1998. It produces weapons systems using Russian and Indian technologies.